I love games. Most of the time, I play fast-paced, exciting, enthralling, or scary games that have my heart racing and keep my adrenalin levels high. For once, however, I got the chance to play a game that departs from this convention. Flower, a Playstation Network title and a PS3 exclusive, is a game that’s — believe it or not — actually relaxing to play. This may sound really boring, like describing a fancy new version of Mahjong for the game console, but it’s really not. I found Flower to be a uniquely captivating experience. 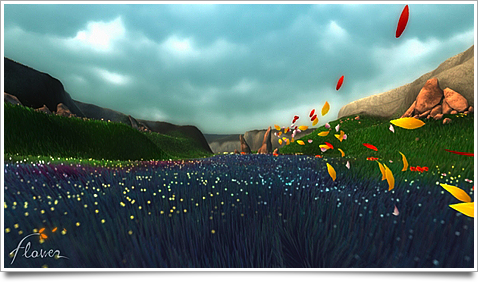 Flower, after a quick download, puts you in control of a wind gust that blows a flower petal over a (gorgeous) grassy landscape. You determine its strength, and as the petal meets other brightly colored flowers, more flower petals join the whirl. 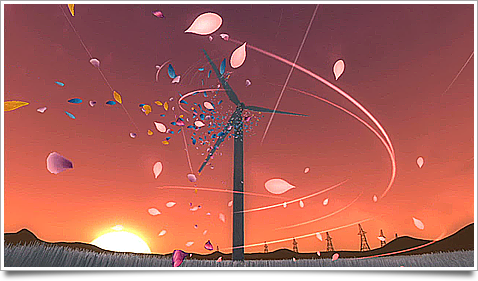 As you progress through the landscape, you start accumulating a gorgeous trail of colorful flower bits, and you progress through the time of day and the landscape, meeting windmills, sunsets, a night-time field with (apparently) power-generating plants, and much more things I wouldn’t want to spoil. It’s worth noting that the graphics really are stunning; every unique leaf of grass is rendered and moves individually and the framerate is solid. As you may have figured out, its best to watch a solid quality video of this than to imagine it, as it sounds rather clumsy and pointless. 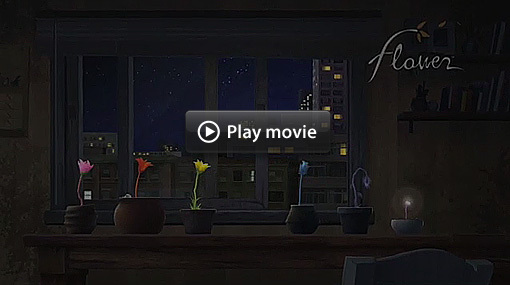 For the real quality junkies: watch the review of Flower in HD at Gametrailers. I suggest you watch this review in HD, as it really does it justice. Once you have the controller in your hands and you start ‘gliding’, there’s really no stopping it: you find your muscles relax, your heart rate drops, and a warm feeling glows in your belly. At the same time, there is a genuine challenge in actually rounding up all petals (it’s not a requirement for completion or progress, furthering the ‘relaxed gameplay’) or finding the green flowers that let you acquire the ‘Discovery’ trophies. Other than all that, the replay value and control scheme set it apart from other titles. There’s no using the analogue stick or d-pad to control movement, but the (often horrible) SIXAXIS motion sensor in the wireless controller is used. These controls are terrible for games like Wipeout HD, or GTA IV, but they’re genuinely fun and natural-feeling in Flower. I’ve yet to find a point in the game where I really got frustrated by the way the controls work. Flower is a mere 10 dollars (that’s not a typo, it’s actually 10 dollars) or comparatively priced in your local currency. I wish I could invite you to play it with me online, but only the singleplayer ‘campaign’ is playable. I long for a future expansion on Flower, with possibly landscapes like forests and beaches, and cooperative multiplayer, but until then, it’s still a great way to attain zen-like relaxation with a controller in your hands. And let’s be honest; that’s most likely the first time you can say that about a game. Excellent post, I really enjoyed playing it too, ever so relaxing. Hopefully it will be successful enough to warrant more than just a handful of PSN developers to take a crack at something as original, innovative or even beautiful. Really awesome game! Never heard of it before, probably because I don’t have a PS3, but it reminds me of a Mac game called Tranquility. It’s available for both Mac and Windows, but I think it was on the Mac first, someone correct me if I’m wrong. yes, Flower is nice, a pleasure to play and the ending was epic in a amazing way. it reminded me of story by Kenji Miyazawa.